All pupils attending secondary schools in Scotland must attend school for 27.5 hours per week. Schools are able to decide how these hours are spread over a week. Pupils must also attend for 195 days each session, and with five further days for staff training, there are 40 school weeks in any year. 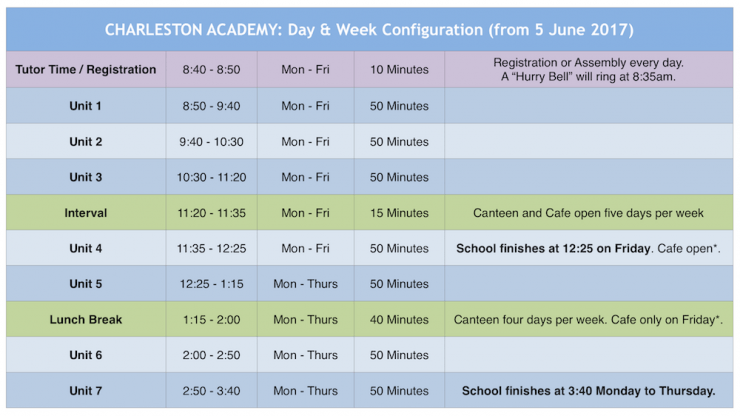 Charleston Academy moved to a 4.5 day/33 period week in June 2016. We consulted with parents at various Parent Information Evenings and our plans were discussed in depth at Parent Council Meetings. From August 2017 all secondary schools in Highland will move to a 4.5 day week and the Secondary Schools in Inverness will also adopt a unified timetable structure. This structure is the one we moved to in June 2016, but with a minor tweak – lunchtimes will be 5 minutes longer, finishing at 2pm. 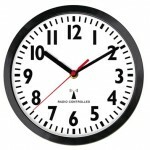 This will mean the school day (Monday to Thursday) will finish at 3:40pm. We will still finish at 12:25pm on Fridays. The School Week/Day Timings that will operate from June 2017 are shown below. Click HERE download a printable version.